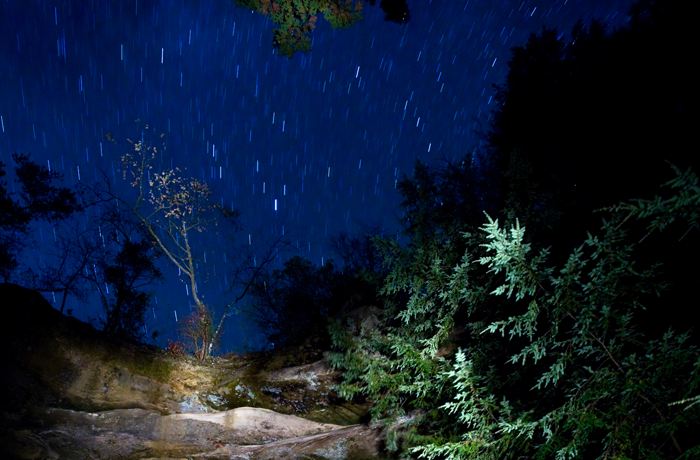 Stars over the natural bridge at Pickett CCC Memorial State Park, Tennessee. Photo by Mike Serkownek. A kickoff event is being held on Tuesday, 12 May, at 1 p.m. starting with a solar program for local schools in which participants can safely view the Sun through telescopes. A dedication ceremony will be held at 7 p.m. followed by an astronomy program at 8:30 p.m. Places experiencing natural darkness at night are rapidly vanishing in much of the United States especially east of the Mississippi River, an area that includes much of the country’s population. This fact underscores the need to defend sites with dark night skies for the benefit of wildlife and humans alike. One location at the edge of the Cumberland Plateau in northern Tennessee has done just that, taking steps to preserve the nighttime environment for current and future visitors. With the support of a Clean Tennessee Energy Grant, lighting on the two properties was updated to meet IDA’s rigorous standards. In partnership with the Barnard-Seyfert Astronomical Society and the Space Science Outreach at the University of Tennessee, the Park has developed a strong interpretive program. Activities include an annual New Year’s Eve hike, a Junior Ranger Camp each July, an annual star party, and regular dark skies programming during peak visitor season in the summer. IDA established the International Dark Sky Places conservation program in 2001 to recognize excellent stewardship of the night sky. Designations are based on stringent outdoor lighting standards and innovative community outreach. Since the program began, 10 Communities, 23 Parks and nine Reserves have received International Dark Sky designations. Tennessee’s 56 state parks offer diverse natural, recreational and cultural experiences for individuals, families, or business and professional groups. State park features range from pristine natural areas to 18-hole championship golf courses. There is a state park within an hour’s drive of just about anywhere in the state, offering a variety of recreational, lodging and dining choices. For more information about Tennessee State Parks, visit tnstateparks.com or connect via Facebook, Twitter or Instagram.